1. 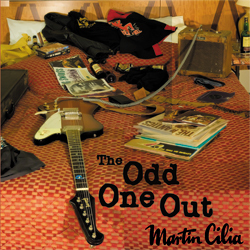 The Odd One Out – A bit of fun played in 2, 3, and 4 part harmony using my white 1961 Fender Stratocaster into a early sixties AC15 twin amp and 1961 Fender 6 string bass played through a 1966 blackface Fender Super Reverb Amp. 2. Real to Reel – The melody guitar is my 1963 candy apple red Strat played through my 1964 Vox AC30 amp and the rhythm guitar is the 1961 Strat. 3. Cry For A Shadow – This Beatles tune is played using my 1964 Gibson Firebird guitar into an Alesis QuadraVerb GT direct to tape. A Blond 1962 Gibson J200 acoustic is on rhythm. 4. Exile on Chapel Street – Guitars used on this track are a Gibson 1958 Les Paul Goldtop into a 1973 Marshall 100 watt amp and quad box. A 1965 Burns Double Six 12 string in greenburst and the 1961 white Strat. 5. Medication – Played on a Gibson Chet Atkins nylon string guitar. 6. The Same Song Remains – 1958 Gibson Les Paul into a Quadraverb GT then plugged into a tweed Fender Champ amp. 7. Old Guitars – This one is from the archives! Recorded on an 8 track recorder as a demo. I think this song has merit and deserves to be heard so I have included it on this album. Guitars used – Gibson Chet Atkins nylon string, Martin D28 acoustic, Fender Strat. 8. Chunky – A funky tune played on a 1960 Gibson Les Paul Junior into a 1958 Fender Bassman amp. Rhythm guitar is an L series Fender Stratocaster. 9. Pick On Me – I played this on my 1956 Fender Telecaster into the tweed Fender Champ Amp. 11. West of Bondi – Melody is played on a 1959 Gibson Les Paul Custom into a 100 watt Marshall Amp and also a Burns Double Six 12 String into a Vox AC30. Rhythm guitar is the white 1961 Strat into a Vox AC30 Amp. 12. 1993 – The intro and slide guitar is played on a 1964 Gibson Firebird. Main melody and solo guitar is the 1958 Gibson Les Paul Goldtop into a Quadraverb then a tweed Fender Champ amp. Rhythm guitar is a 1960 Les Paul Junior into a 1973 50 watt Marshall amp and box. 13. 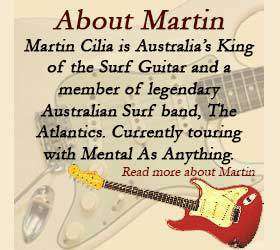 Road To Ballarat – A solo guitar piece played on my 1935 Martin 00-17 acoustic guitar.